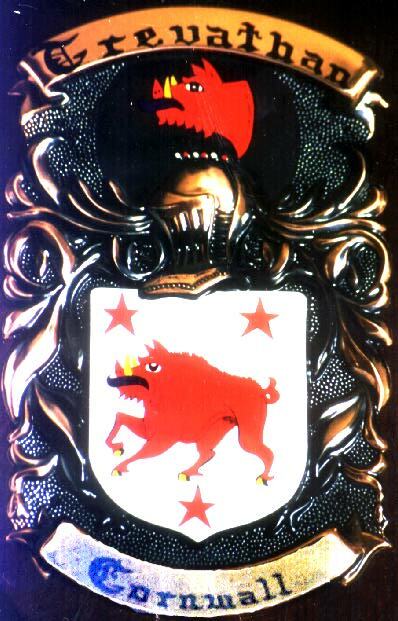 A Coat of Arms that do not belong to the Trevethan / Trevathan family. The College of Arms in London has no record of these Arms for our family. Line drawing of the same Coat of Arms. Another drawing of the same Coat of Arms. Quartered Arms for Trevarthian, Carminow, Heligan and Bodrugan familes of 1396. Note this is the same Arms as those to the left. Yet another Coat of Arms nearly the same as the others but this time for the Trefethan family. Very old drawing of Trevithven Family Coat of Arms 1573. This family became the Trevethan family of today.